Life is full of natural opposites: salt and sugar, darkness and light, McClaren and Ferrari. One of their commonalities is that if you strengthen one, you weaken the other. This is an age-old paradox in mechanical engineering as well. You might, for example, want to minimize the mass of a design, but you also want to maintain a certain level of stress. Then you have encountered what is known as a pareto front – the more you minimize the mass, the more you maximize the stress. Now this is a simple example, but it is often quite difficult to find the right trade-off between conflicting design goals. Because there are several pareto optimals; designs that balances right on the edge of your conflicting objectives. 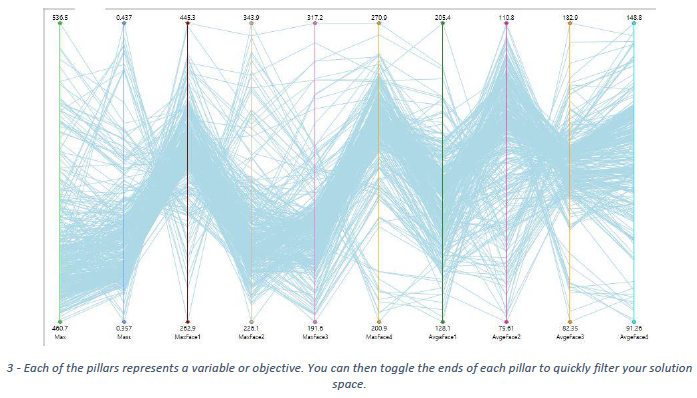 But modelling, simulating and leveraging those alternatives is very time-consuming and leaves no guarantee that you will have the best selection of pareto optimals. 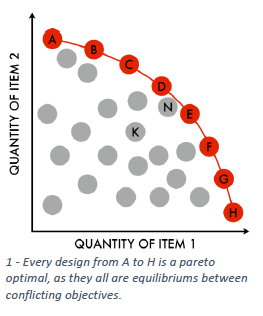 Every design from A to H is a pareto optimal, as they all are equilibriums between conflicting objectives. If you want a thorough overview of a pareto front there is only one option: computer-aided optimization. By using optimization algorithms, you can automatically explore hundreds of designs 24/7. If you are dealing with a pareto front, the algorithms will even gradually help you locate “the optimal of pareto optimals.” Meaning the algorithms will first explore a variety of concepts and use that data to perfect similar designs based on your goals. To see an example of this, watch the video below, which highlights a heat sink for a lightbulb (taken from the SOLIDWORKS Simulations Professional training manual). The goal is to reduce the mass of the heat sink by altering the size, shape and number of fins, while making sure the temperature remains below 76°C. In other words, a pareto front. After CORTIME has run the optimization, the pareto front becomes visible in the 2D graph. This is an example of mass reduction vs. temperature. CORTIME’s algorithm finds the pareto front, but at the same time quickly identifies “the optimal of pareto optimals,” and presents the user with a number of feasible iterations in this area. It is also interesting to note that CORTIME helps you out by concentrating on the area, where it believes you will get the best trade-off between conflicting objectives and starts refining those designs. 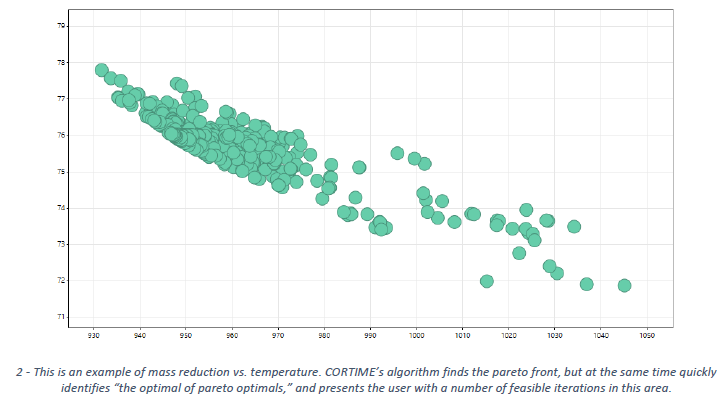 To get you the best tools for evaluating your pareto optimals, CORTIME has a Parallel Coordinates (PC) graph. It allows you to input all the variables and objectives of your optimization, so you can easily find your best design. Each of the pillars represents a variable or objective. You can then toggle the ends of each pillar to quickly filter your solution space. It is the only way you will get the data you need to make the optimal trade-off. It is the only way to get analysis tools to thoroughly evaluate the trade-off. So, do you have a pareto front you want to explore? Maybe CORTIME can help. Throughout his career, Rasmus has worked with R&D in several industries including maritime and wind. He became the CEO of CORTIME in 2015, because he saw a need for an intuitive, integrated design exploration tool for SOLIDWORKS. As a devoted SOLIDWORKS user, his gratitude for SOLIDWORKS rises every time he encounters another CAD program.